Take on the forces of capitalism, mix it with a love of building new things, and graft on a simple freemium gaming mechanic to allow in-app purchasing. Basic ingredients that in the wrong quantities can doom a sim-style game. 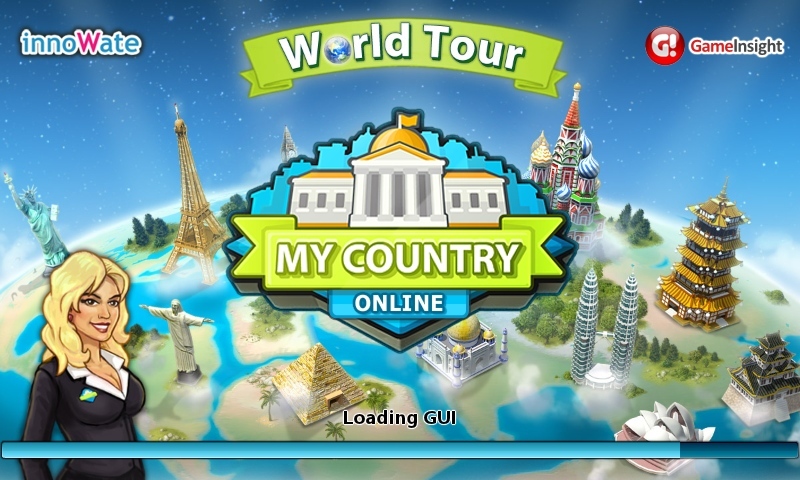 Thankfully, this title misses most of the pitfalls of the genre, and makes some smart design decisions on how to address 'snacking' mobile gameplay to bring you 'My Country', one of the better games I've seen in this genre. In My Country you are tasked with building a city (or lots of smaller interconnected cities, it's up to you). 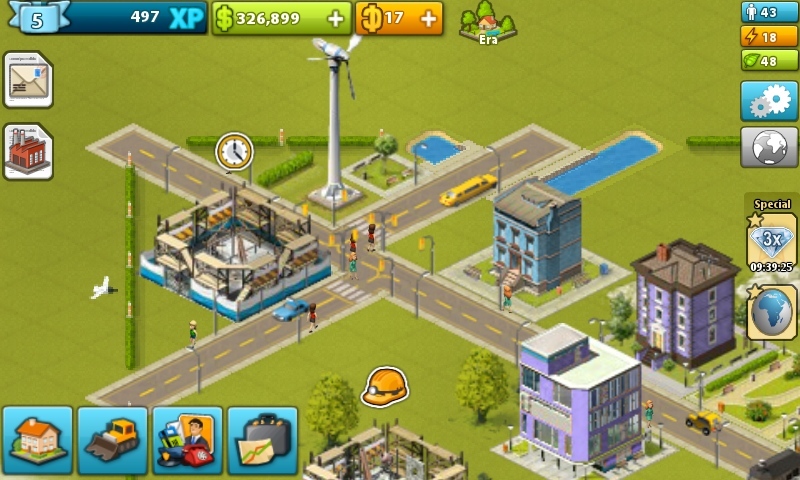 From the motley collection of buildings around a single road you are presented with when you start a game, you need to build up funds, complete tasks, construct new buildings, manage services, and employ people as you expand from backwater to bustling metropolis. Feeling very much like an old-school clone of Sim City, My Country presents you with a world happy in its isometric layout, and helps you build it up. The first half or so of gameplay is laced with helpful dialogs and tutorials to get you started, but very soon you'll be making your own decisions. Thankfully the game doesn't completely abandon you to plan your own town - through a series of tasks and challenges, you are gently guided towards continued success. This does take away slightly from the open nature you would expect from a sim game, but the direction that it does give you is welcome in a mobile title. Because the nature of the game is to dip in and out, having the 'tasks' reminding you what to do next for growth is a nice piece of design that allows open gameplay over many hours to be mixed with structured tasks for short bursts of gaming. How the game mechanics flow these tasks illustrates this nicely. You'll be asked to construct a building that will benefit the city (the first requested building is, of all things, a garage for a Taxicab company). Once this is built, you need to hire someone to work inside it - you might be lucky and be able to hire them straight away with cash, or you might need to collect objects to tempt them (objects that, as you progress in the game, can be built by other previously constructed places of employment). Once you have all of these, your employee can get to work, which you assign, and earn you experience points to level up, and cash to spend in other areas of the game. And you do need to keep things in balance, not just with the money, but also in terms of electricity powering your city and the 'ecology' of the city - if you start building a lot of factories then you'll also need to build in parks, trees, and recreational spaces to balance out your city. The game will keep you right here as well. Throw in a few of these tasks, mix them together, and you'll always find something to do for a few minutes. I say a few minutes, because everything takes time in My Country, so you have every opportunity to switch away and get on with real life, while the simulated game will simulate the time passing when you return and you can see what's been built. Or you can spend money to speed up the progress. As many gamers have come to expect, this is a freemium title with two currencies. 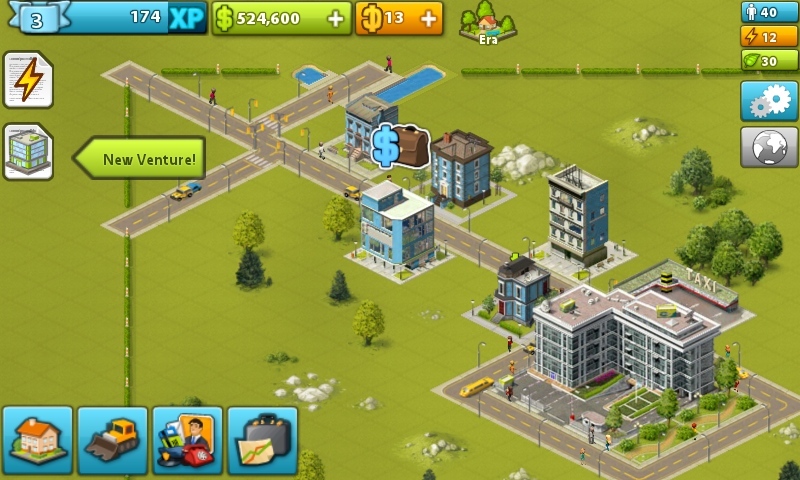 There is the basic in-game currency (the green Game Dollars) where you earn the cash through tasks and challenges, building up a bountiful supply with ease. 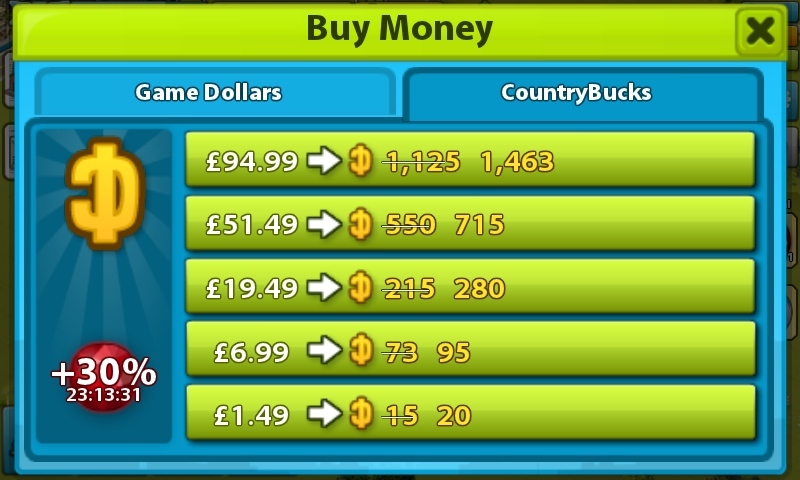 Of course, all the modifiers that speed up the game and bypass some of the challenges in completing tasks use the yellow 'CountryBucks', and while you can get a sliver of supply of them through playing, if you want a decent amount of them to spend you will need to spend hard cash using the in-app purchasing system provided by the Windows Store. As you would expect, the in-app purchasing levels scale up rather quickly, from a handful of CountryBucks for £1.49, to an eyewatering £94.99 level with 1125 Bucks on offer (or here, being tempted with a time limited 30% bonus on all bucks bought). 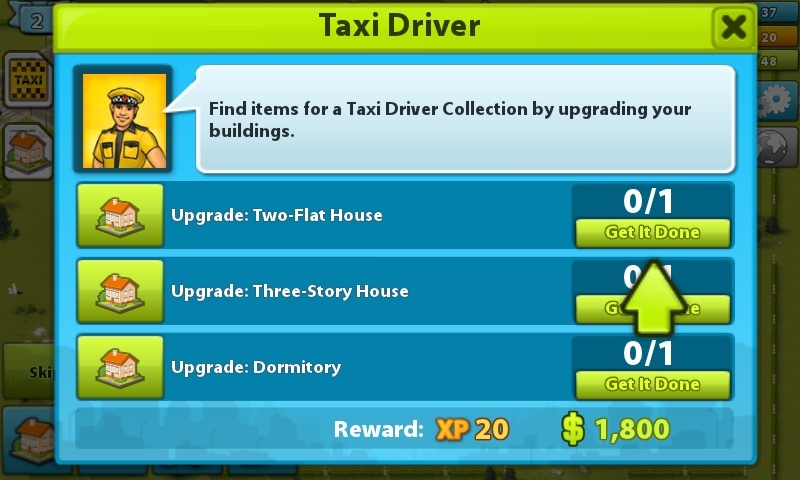 Given that the cost to accelerate the construction of a small building is two CountryBucks, to buy an item to help hire a worker is around five CountryBucks (and that's just as you start), you can see that to buy everything with the currency wil be a very expensive game. 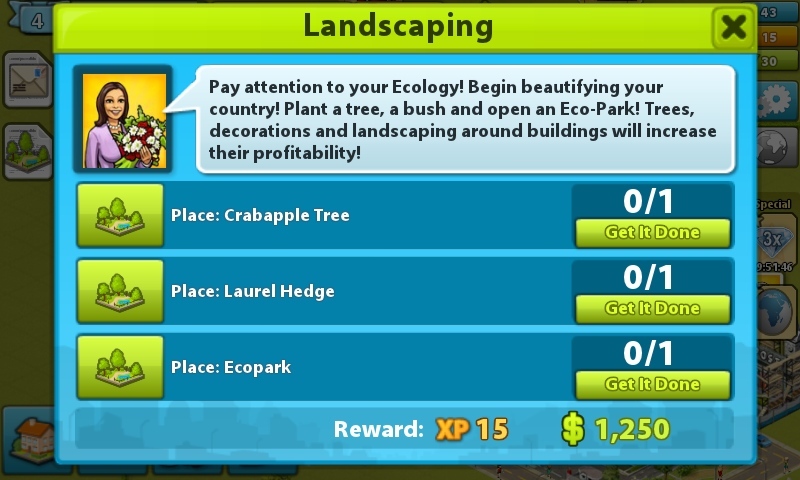 I suspect the majority of players will simply wait for items to be finished, but the designers will know that just a few people buying the CountryBucks will subsidise the production costs of the game and help turn a profit. The graphics are very much in the old-school isometric style - there's no cartoon nature or inherent fun to them, but they are incredibly varied, so it's easy to tell buildings apart - and when there are dollars or experience bonuses to pick up that are on 'top' of the game world. I like that when you are in the process of construction, you can see the building taking place - and of course the people moving around the city as they work and live. Pinch to zoom works here, as does a quick swipe of the finger to scroll around the world - as you play through the game you will start to build a huge city over many screens if you stay zoomed in. My Country does its best to always give you something to tap in the early stages, but as you play through there are a few more time barriers, which force you to wait - or to pay up. Like many freemium games, there comes a point where you realise that the grind is simply not worth it any more. It takes too long for tasks to be completed for free, you don't want to spend any more hard cash on the real world currencies that speed construction and tasks up, and you simply fall out of love with the game. I'm fine with that - adventure games have a 'game over' which stops the clock on regular games, but freemium games don't have that.. you simply burn out on the game, and move on. No regrets, no difficult separation, just an acknowledgement that your time with a title is up. If you can face up to that (and after playing many 'infinite world' titles, it comes to me quite easily), then you should get on fine with My Country. It's not breaking any new ground in either the sim genre or the freemium income models, but it does it well, with clear graphics, good sounds, a polished UI, and with a minimum of fuss. In short, it's a solid entry in the Windows Phone Store that entertains you without surprising you.